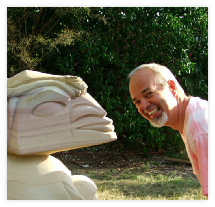 Sculpture is my passion and my calling - and after 35 years of creating sculptures, I still get excited about each piece I create. My sculptures have found homes all over the world and throughout Australia. Most of my sculptures are carved from stone, a durable eco friendly and timeless material, lending itself to different textures and polishes. I have also created bronze, stainless steel and wood sculptures. I work with you to create a sculpture that will suit your space, indoor or out, a contemporary piece that will last and carry with it the meaning of your place in the world. Antone's excellent piece causes me to reflect on the lives of the last inhabitants of Emu Vale and their special relationship with the Emu Creek and its beautiful valley and rolling flood plain. These people were of the Keinjan Tribe and lived, hunted and camped in the valley and alongside the clear waters of the creek. Antone has captured an expression in stone, which perfectly reflects the serpentine nature creek, the primeval creatures that still inhabit its depths, and I think, the might and majesty of the surrounding mountains. Thank you seems not enough to express the wonder and joy gained from the presence here of “The Nightwatcher”. In awe, I see her interact with Sun and Moon, wind and rain. She absorbs their energies. The play of light and shadows and raindrops reveal so many transformations. So amazing. It is as if she is responding and pulsating to the rhythm of life. Her hollowed wing, sometimes wing, sometimes petal, at other moments becomes a portal, even a second bird. Continually changing, observing, calling our senses to attention. You have an amazing gift and we are so blessed to have you share it with us. Christina and Brian, owners of "The Nightwatcher".